In May, Elizabeth’s piece, Tempest, which VocalEssence read last year, will be premiered by The New Amsterdam Singers in New York City. Elizabeth was one of twelve composers selected from around the world to participate in ASCAP’s prestigious film-scoring workshop with Richard Bellis, and she provided additional orchestrations for the score to National Geographic’s Emmy Award-winning Great Migrations series. She’s written an opera, co-composed a musical, and won Audience Favorite in a national Iron Composer competition. Currently, she’s completing a string quartet, and is about to start a new orchestra piece as part of her dissertation as a doctoral candidate at Juilliard School of Music. As we said, “busy” doesn’t do her justice. 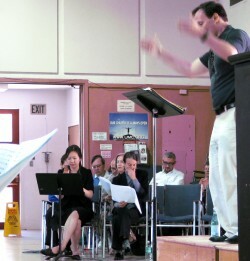 Elizabeth Lim and Libby Larsen follow their scores during the 2010 Composers’ Workshop. Elizabeth says she loved working with WomenSing and Youth Inspiring Youth. “The whole experience was wonderful, from getting the commission to write a piece for WomenSing, to picking a poem. Martín was great about being involved in the whole process and sending me detailed emails about what would and wouldn’t work as well for choir.” At the time Elizabeth was new to writing for choir and the experience provided her with valuable guidance. In spite of her busy schedule, Elizabeth insists she does have spare time, which she spends going to movies and, as a “huge foodie,” going out in New York City looking for good food. 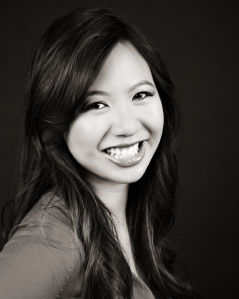 As for us, we’re looking forward to more wonderful music from Elizabeth Lim!